NGV, Melbourne: History, Permanent Collection Highlights. Best Art Museums in America. See: Art Museums in Europe. The National Gallery of Victoria (NGV), located in the Victorian city of Melbourne, is one of the best art museums in Australia. Founded in 1861, it is the oldest public gallery of art in the country with 70,000 works of art, including painting and sculpture as well as prints and drawing, plus contemporary types of art including photography and installation. Reflecting the twin-focus of its permanent art collection, the NGV is spread across two sites. These are: NGV International, with its collection of Old Masters and other international art, situated on St Kilda Road, just south of the Yarra River, in the centre of the Melbourne Arts area of Southbank; and The Ian Potter Centre: NGV Australia, noted for its collection of Aboriginal art and other styles of Australian art - notably Australian Impressionism - located at nearby Federation Square. The NGV is Australia's most visited gallery with almost 2 million visitors per year, and the world's 24th most popular art museum. Other major art venues in Australia include: the National Gallery of Australia (Canberra), the Queensland Art Gallery (Brisbane), and the Art Gallery of New South Wales (AGNSW), the Art Gallery of South Australia (AGSA), and the Art Gallery of Western Australia (AGWA). Other notable cultural venues in Melbourne include: the Australian Centre For Contemporary Art (ACCA), the Centre for Contemporary Photography (CCP), the Johnston Collection of fine and decorative art, the Islamic Museum of Australia (IMA) and the Museum of Chinese Australian History. The National Gallery of Victoria was established in 1861 in what was then the largest city in the richest colony in Australia. In 1867 the city opened the NGV Art School which was the leading academic arts centre in the country for the next fifty years. In 1959 the first moves were taken to expand the NGV and design a new gallery and cultural centre. This led to the building of two new centres: NGV International housed in the St Kilda Road building (designed by architect Roy Grounds, later renovated by Mario Bellini), which opened to the public in 1968; and the Ian Potter Centre: NGV Australia (designed by LAB Architecture Studio in association with Bates Smart Melbourne) in Federation Square, which opened in 2002. A legacy of the philanthropist Sir Ian Potter, the centre is famous for its unusual design features, including its water-wall entrance and the huge stained glass ceiling created by Australian artist Leonard French. The NGV's permanent collection embraces both Australian and International works, divided respectively between NGV Australia (Federation Square) and NGV International (St Kilda Road). The Ian Potter Centre outlines the story of Australian art using an extensive program of temporary exhibitions and displays. The NGV's Australian collection - numbering roughly 25,000 works, including paintings, sculpture, photography, prints, fashion and textiles - includes works by Australian artists, spread across several eras. These include: Aboriginal art, Torres Strait Islander art, Australian Colonial Painting (from 1788), the Heidelberg School of Australian Impressionism (1886-1900), Australian Modern Painting (1900-60) and contemporary art up to the present day. Particular highlights include works by Australian Impressionist painters, who painted just outside Melbourne in the country suburb of Heidelberg. 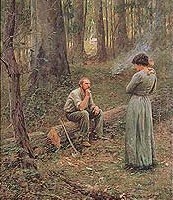 Examples include: The Pioneer (1904) by Fred McCubbin (1855-1917), considered to be one of his greatest genre paintings; as well as his evocative landscape Lost (1886); the scenic masterpiece entitled The Purple Noon's Transparent Might (1896) by Arthur Streeton (1867-1943); as well as his landscape Near Heidelberg (1890); and the iconic painting Shearing the Rams (1890, National Gallery of Victoria) by Tom Roberts (1856-1931), chronicling work and life in rural Australia. Other important Australian artists represented include: Russell Drysdale (1912-81), Sidney Nolan (1917-92), Arthur Boyd (1920-99), Albert Tucker (1914-99), John Perceval (1923-2000), Margaret Preston (1875-1963), the photographer Bill Henson (b.1955), Howard Arkley (1951-99), Fred Williams (1927-82) and others, as well as Aboriginal artists including Barak, Judy Watson, Emily Kngwarray and Uta Uta Tjangala. The NGV's international collection includes examples of ancient Egyptian sculpture and Greek pottery, as well as Roman art and pre-Columbian art. There is also a separate gallery devoted to Oceanic art and the indigenous cultures of the Pacific area (Melanesia, Micronesia and Polynesia). Its Asian section is represented by a spectacular array of decorative art, along with a gallery space showcasing some 4000 works of Chinese and Japanese art, as well as items from elsewhere in SE Asia, including Indonesia. Flemish Painting (1350-1500) [eg. Hans Memling]; Renaissance art (1400-1550) [eg. Paolo Uccello, Correggio]; Venetian Painting (1450-1800) [eg. Paolo Veronese, Tintoretto, Canaletto]; Venetian Altarpieces (c.1500-1600) [eg. Paris Bordone]; the Neapolitan School of Painting (1600-56) [eg. Jusepe de Ribera]; Baroque Art (1600-1700) [eg. Rubens, Poussin, Gentileschi, Bernini]; Dutch Baroque Art [eg. Rembrandt]; works by the Best English Painters (c.1700-1900) [eg. Gainsborough, Constable, Turner]; French Impressionism [eg. Cezanne, Degas, Manet, Monet, Pissarro, Renoir]; Ecole de Paris [eg. Picasso, Modigliani]; and Abstract Expressionism [eg. Mark Rothko], among others. Other types of art in the collection include fashion and textiles, furniture, sculpture, as well as a 15,000-item collection of fine art photography - the first of its kind in any Australian museum. Closed Christmas Day and Good Friday. Kakadu National Park, Arnhem Land, Northern Territory. Earliest art in Australia to be scientifically dated.  For more details about painting & sculpture in Melbourne, see: Homepage.